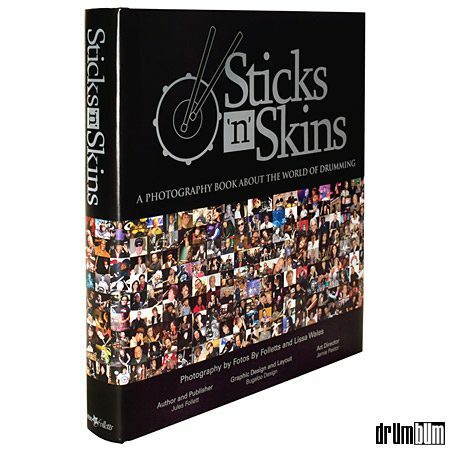 Sticks ‘n’ Skins Drums Photography Book – A Photography Book About Famous Drummers and the World of Drumming – Discover the heartbeat of music in this huge 560 page full-color coffee table book. Sticks ‘n’ Skins is dedicated to late drumming photographer Lissa Wales and opens with a tribute to her work. Illuminating the eclectic world of drumming over the past 70 years, the book features never-before-seen photos and stories of legendary drummers including Louie Bellson (Benny Goodman), Steve Gadd (Barbara Streisand), Jim Keltner (Bob Dylan), Hal Blaine (Elvis Presley), Ginger Baker (Cream), Charlie Watts (The Rolling Stones), David Garibaldi (Tower of Power), Anton Fig (Late Night with David Letterman), Nigel Olsson (Elton John), Chad Smith (The Red Hot Chili Peppers), and many more. Sticks ‘n’ Skins is not only visually inspiring with its stunning photos, but also preserves the legacy of the drumming community. Sure to become a drummer’s collector’s item, this extraordinary drum book offers fans young and old a different perspective on some of the biggest names in music history. This large hardcover book contains almost 8 pounds of drumming knowledge! This unique drums gift is a must have for drummers everywhere. Hardcover/Softcover Book approx. 12″ x 11″ x 1.5″ and 560 pages. *This item ships from another location within 5 business days. Drums Books and more at DRUM BUM!